Henry Campbell was the eldest son of William and Mary Jane Campbell. He was born on 1st November 1884 in the Desertcreat, Cookstown area. He was one of at least five children. He was an agricultural labourer. He was married with two children. Henry Campbell was a reservist and was called up in August 1914. He enlisted in Cookstown and was almost immediately sent to the front. 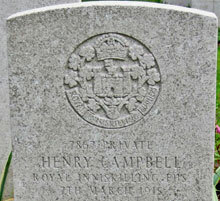 Private Henry Campbell was serving with the 2nd Battalion of the Royal Inniskilling fusiliers when he died from wounds at Rouen on Sunday 7th March 1915.